Thanks so much for making the trip out despite the last blast of winter (lets hope its the last). What a shocking way to shake out the cobwebs. Both days it turned out pretty darn nice considering….although Saturday was much warmer than Sunday, if not way muddier too. You guys and gals are the best though, and I couldn’t be happier than to have you all out to race. Good work to all our winners this weekend: Tatjana, Daniel, Jocelyn, Leland, Rhett, Brandon, Paul, Harry, and especially to Mike Montalbano for working his way up to the front on a Single Speed and taking the overall win on Sunday. Hell of a good race everyone! If you have your own photos from the weekend, tag them with #MichauxORW so that we can all search and view them on facebook and instagram. I only got a few pictures and they aren’t all that great, but the cold was really hard on batteries this weekend. Until next time, ride hard and have some fun. 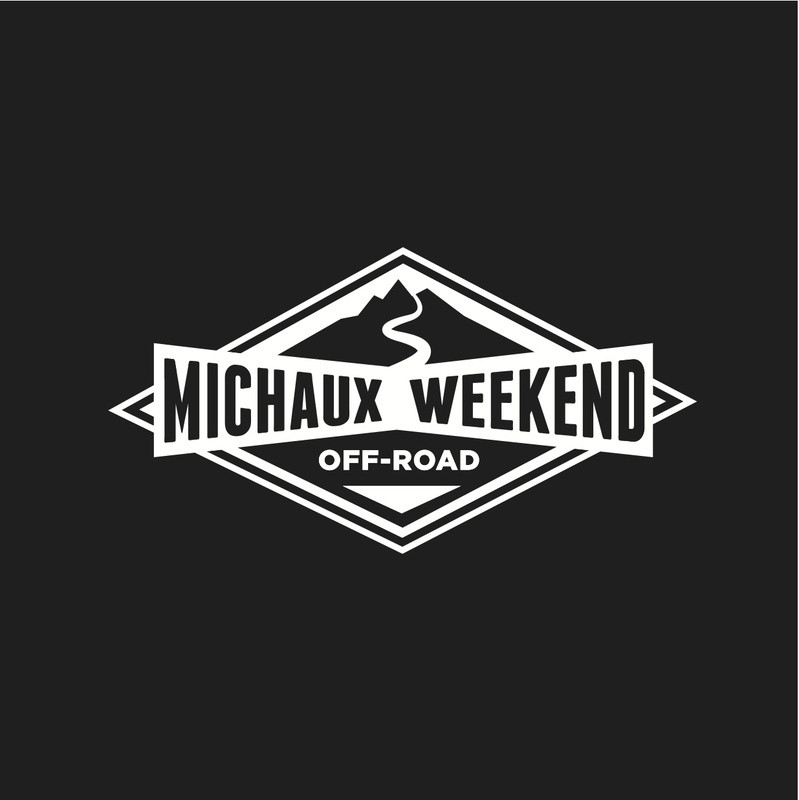 We are about a month out from the Michaux Off Road Weekend, and I’ve gotta say that the rush is looming overhead already. I know that the next four weeks will blow by in the blink of an eye. I try keep things fresh by switching up some details every year of these races, but this year I was somewhat forced into more change than expected. My first change for the line-up this year was swapping the date with my Tuscarora Off Road Weekend. 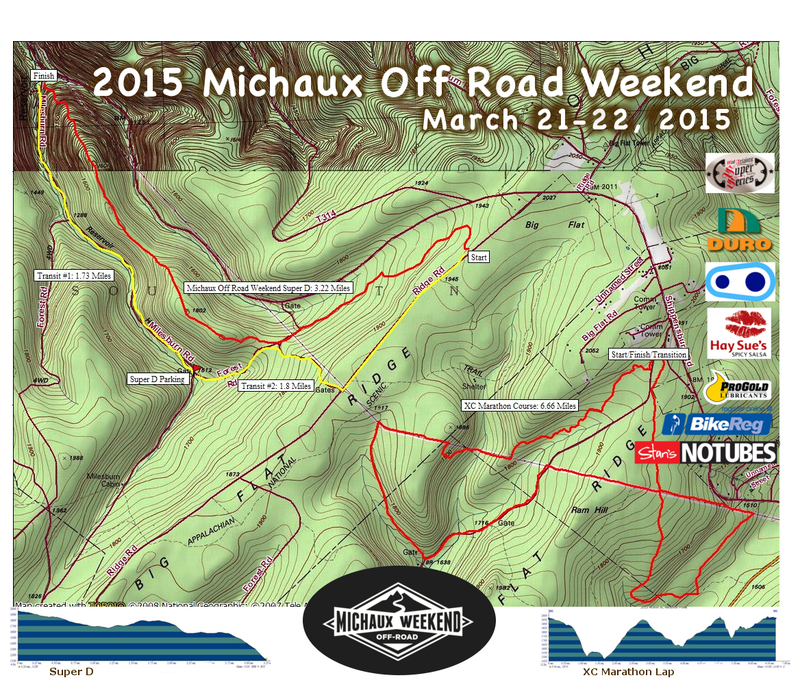 The most exciting, and unexpected change for this years Michaux Off Road Weekend is a new Super D Course. The course change came about due to a logging operation that is currently taking place on Canada Hollow (last years course). Reports started coming in from several locations that due to the logging, the single track we used the last two years just disappears halfway down the trail into the calamity that is a logging operation. We will hopefully be working with Forestry on restoring the Canada Hollow single track later this year as an official trail, but for now we are moving the race course to one of my other favorite runs. The new course is comprised of Three Pines, Gilbert, and Scientology with the gathering/parking spot halfway up Milesburn Road at the Gilbert Intersection. 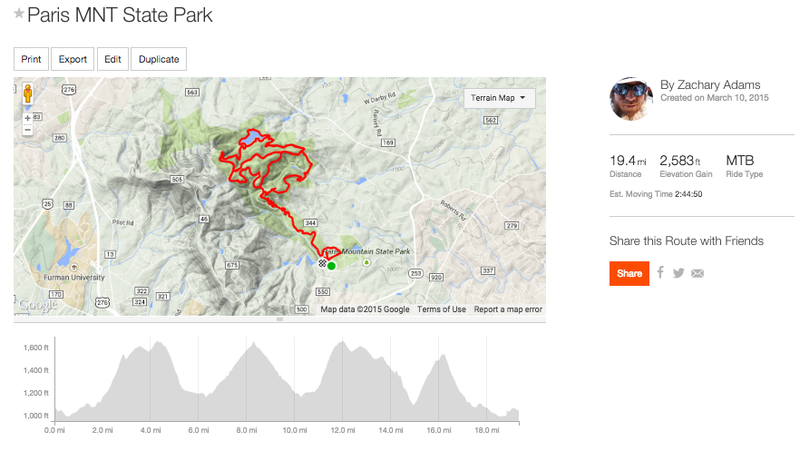 If SuperD has historically been defined as 20% uphill and 80% downhill, then we are just about spot on with a 3.2 mile run , just shy of 1000′, that has a 14% climb to 86% descend ratio. I really enjoy this run, because it is one of the few options existing that makes use of just about all the elevation from the top of the ridge down to the Cumberland Valley. The top section on Three Pines is swooping and filled with moto flavor, dropping some initial elevation. The section on Gilbert traverses the ridge a bit, continuing to drop some slight elevation with two tight shoots between scrubby pines where the double track has narrowed to a thin ribbon. It flattens out before a short but punchy and loose climb on Scientology. Scientology crescendo’s down the mountain on a narrow ridge line like Stairway to Heaven by Led Zeplin, gaining momentum to a blinding of fury as you shred down the trail……smiles high and arms pumped at the finish line on Milesburn Road. I can guarantee you that I will make sure I get to race this one. The weekend layout is as it has been the last two years: Friday Course Practice and Camping, Saturday Super D and Camping, and an XC Marathon on Sunday. If you are not familiar with XC Marathon, it is a 4 hour race on a shorter loop, where the fastest time with the most laps wins. When the course is closed at four hours, the people who are out on laps get to count those as their last lap….so technically, it could be a 4.5 hour race for the win. Race Headquarters with camping, bathrooms, and the XC Marathon Race start is based out of the Big Flat Parking Lot. You can also ride to the top of the Super D course from there pretty easily. The XC Marathon course is a mostly a mix of double tracks and two sections of single track characterized by very steep, rocky descending. The other change that comes this year is from the Mid Atlantic Super Series. 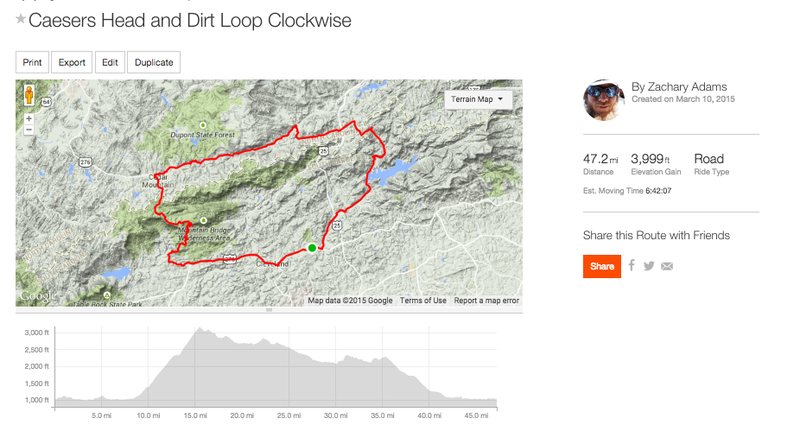 We decided to put together an Enduro series this year. “All Mountain Series” better describes it, but it seems like I got out-voted on the name. It is made up of approximately 7 races (there are still a few small details to work out). 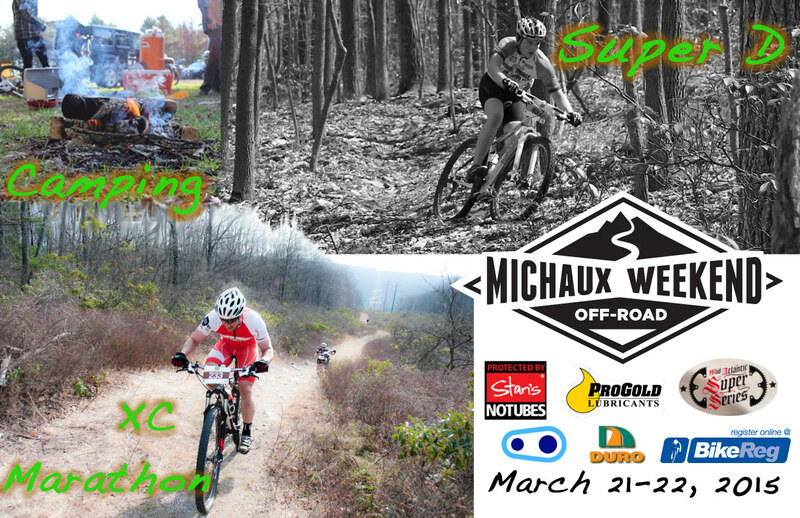 It’s something like this: Michaux Off Road Weekend Super D, Rattling Creek Enduro, Tuscarora Off Road Weekend Enduro, Bear Creek Enduro, Steel City Enduro, and 2 Days of Enduro at Rothrock. Exciting stuff. I’ll be trying to do the series if I can swing it. You should too, enduro may be a fad but it’s incredibly fun.